Large Chinoiserie Stencil 1 has been designed for stencillers demanding the highest quality designs for creating stunning effects. 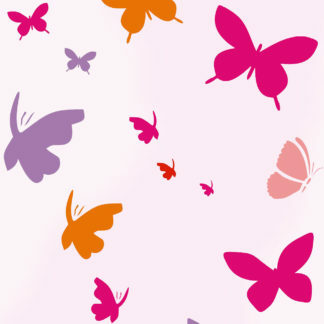 Each stencil panel is subtly different and designed to work individually or as a pair together. 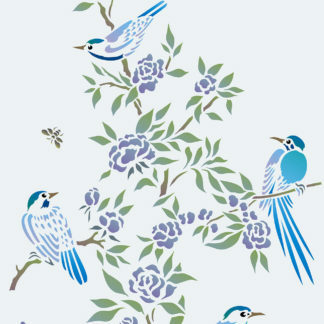 This page features Chinoiserie Stencil 1. 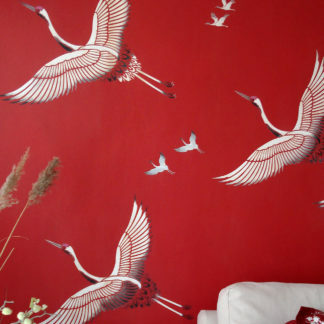 See also Chinoiserie Stencil 2. 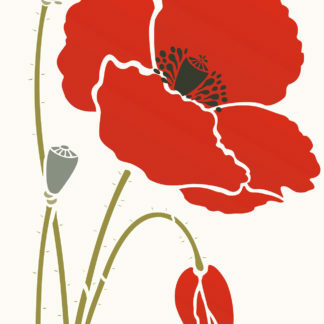 You can now purchase both stencils as a pair at a specially discounted price. Above top – Chinoiserie Stencil 1 is beautiful applied on a raw silk panel in Motif Fabric Paints: Magenta Pink, Strawberry Red, Leaf Green, Light Lime, Sunny Yellow, Cobalt Blue, Bright Purple and Pure White Fabric Paints. 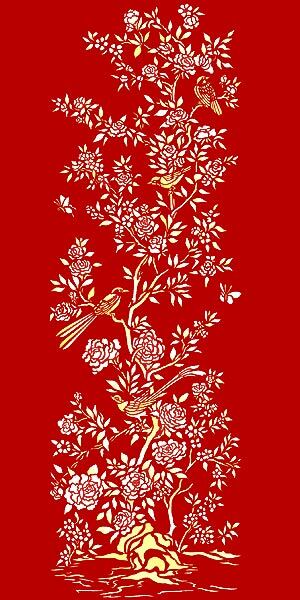 Above– Chinoiserie Stencil 1 on a Chinese red background, stencilled in Ice White Stencil Paint. 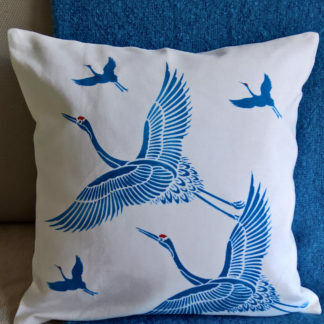 The Chinoiserie stencils are ideal for fabrics. 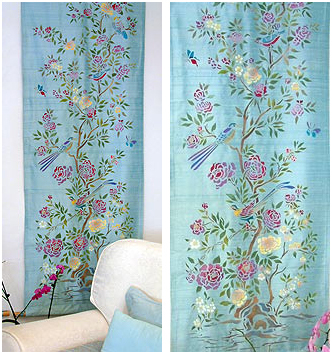 Use to create stunning feature panels, or room dividers, or sumptuous full drop curtains. 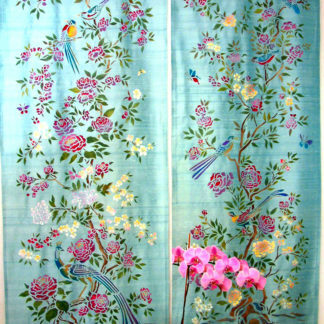 See also Chinoiserie Stencil 2 and the Small Chinoiserie Stencil the same designs on a smaller scale, ideal for cabinets and smaller panels. Above – Chinoiserie Stencil 1 stencilled in a multi-coloured palette of Motif Stencil Paints – Mocha and Coffee Bean (branches, twigs), Arctic Grey, Mocha (rocks and ground), Eucalyptus, Hedgerow (leaves), French Lavender, Agapanthus (butterflies, flowers) and Sienna, Seville Orange, Harvest Gold Paradise Blue (bird details). 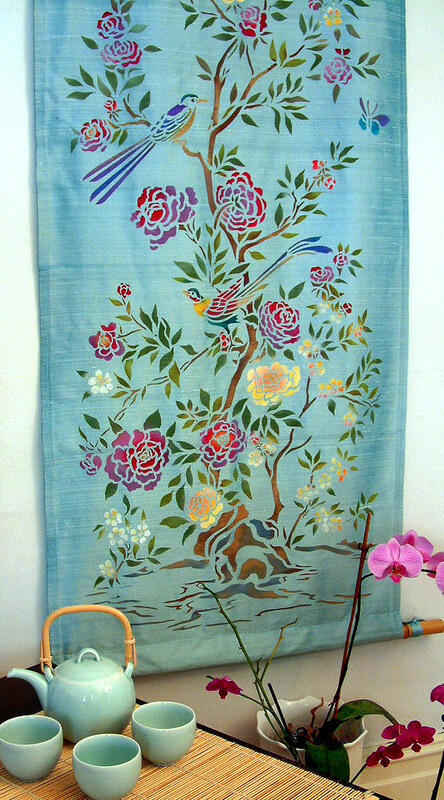 Above – Chinoiserie 1 stencilled onto turquoise raw silk panels in Magenta Pink, Strawberry Red, Leaf Green, Light Lime, Sunny Yellow, Cobalt Blue, Bright Purple and Pure White Fabric Paints. 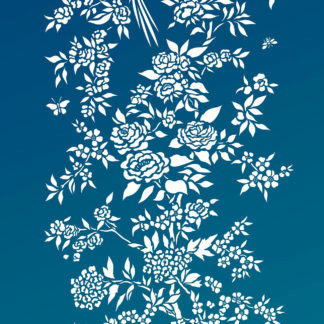 Above – Chinoiserie Stencil 1 stencilled silhouette style in Ice White Stencil Paint on deep chalky duck egg background. Use the Motif Stencil Roller for easy application for this technique. 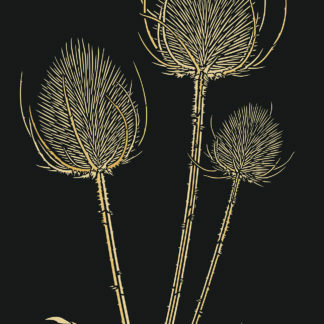 The height of the complete panel is up to approximately 167cm (65.75″) by approximately 53cm (21″) wide.